In DC, Strathmore is usually where one goes to listen to the incredible Baltimore Symphony, experience contemporary dance, or even take in a popular musician’s concert. But Strathmore is not just for the performing arts anymore. In fact, one big reason to take a visit to Strathmore is to get to know Strathmore Fine Art and its Fine Artist in Residence (Fine AIR) Exhibition. Yes, Strathmore has fine visual art! Its Fine AIR program cultivates local visual arts talent in the DC area by pairing emerging artists with established professionals in the community. Here’s how it works: For six months, these young artists build an audience, hone their craft, and premiere a new body of work – all while being guided, critiqued, and taught by stellar local mentors. Read the piece at the Pink Line Project here, and check out the exhibition here, and then come to the opening this Friday from 7-9PM! 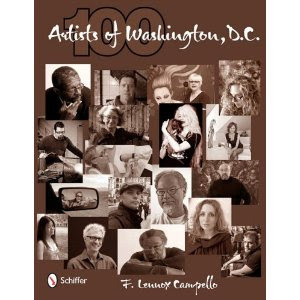 The 100 Washington, DC Artists book should be available at most DMV area bookstores very soon and the book release party will be July 23rd at Conner Contemporary in DC. The book release party is by invitation only, so please RSVP to me at lenny@lennycampello.com if you'd like to be added to the invite list or RSVP on Facebook here. Most of the artists will be there, so this is your chance to get your copy signed by them. You can bring your own copy or a very limited number of books will be available for sale at the party. If you'd like to reserve a book, please email me, as I am only bringing a limited number and a lot of them have been reserved already. The book is also available online at the usual sites (Amazon, Barnes & Noble, Target, etc.) or directly from the publisher. If you want to support your local bookstore, you can have them order it for you here.